At Stromness Spirit of the Sea we have three days of festivities and events for all of the family. As we celebrate Stromness' link with the sea, we're sure that you'll find something to suit your interests - contact us if you'd like any more information! or you can reserve tickets using the contact form! 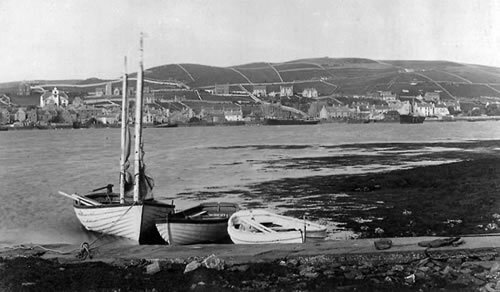 10am - 5pm Aquatera’s Stromness Herring Industry exhibition at the Northlink Ferry Terminal. Join our ‘Molecule Hunt’ in local shops and watch out for our ‘Collector of Stories’ in the streets. Northlight Studio - 'Sand journeys' - weaving exhibition at Northlight Studio, Graham Place. The Stromness Heritage Guides would like to thank Orkney Islands Council and all our sponsors. 5pm - 7pm * Aquatera marine tour and talk to Billia Croo. Price to be advised. 2.30pm - 4pm Taste of Orkney at the Ferry Inn - A hosted afternoon tasting local produce. Your chance to sample tasters of Orkney's magnificant food and drink including berebannocks, flouriebannocks, Orkney farmhouse cheese, Orkney cheddar, sweet cured herring, Orkney oatcakes, Orkney crab toes and Orkney ice-cream. The experience includes ales from the Orkney Brewery and Rob Hill. Entrance by ticket only at £15 per person. Contact the Ferry Inn on 01856850280 or at info.ferryinn.com to book. 8.30pm Smugglers Rum Tasting at the Ferry Inn - Hear about and taste 8 rums with a seafaring background. The evening includes a seafaring ale on arrival, samples of 8 rums, seafood chowder, a cold seafood platter and rum truffles. Entrance by ticket only at £25 per person. Contact the Ferry Inn on 01856850280 or at info.ferryinn.com to book. Join our ‘Molecule Hunt' in local shops and watch out for our ‘Collector of Stories' in the streets.